Marble self cloning crayfish can actually clone itself. It needs NO mate to reproduce!! An absolute marvel. This crayfish is not shrimp safe! Other Scientific Names: Procambarus sp. "marble crayfish"
Size: Approx. 3" - 6"
Unlike most aquarium fishes and shrimp, Marbled Crayfish are not picky about their water at all. They can be housed in extreme conditions and will be fine. This aquarium freshwater crayfish is an Omnivore. They are decent algae eaters, and if sufficient algae is not present, foods intended for aquarium fish and invertebrates can be used to supplement their diet. Another great supplement is blanched (boiled until soft) vegetables. Marble Crayfish do not need a mate in order to breed. They are for lack of a better term "Self Cloning". Their offspring will be excat clones of their parents. They can even be grown in buckets! 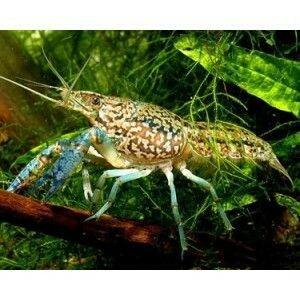 Marble Crayfish are non aggressive and cannot be housed with shrimp.